When I first heard about this story I thought it was an April Fool's joke, but then I realised it's July and the story is actually true!!!! There is a Nazi-themed cafe in the Indonesian city of Bandung, which is the provincial capital of West Java, that features German World War II paraphernalia including posters of Hitler, giant Swastikas and even waiting staff dressed as SS officers. 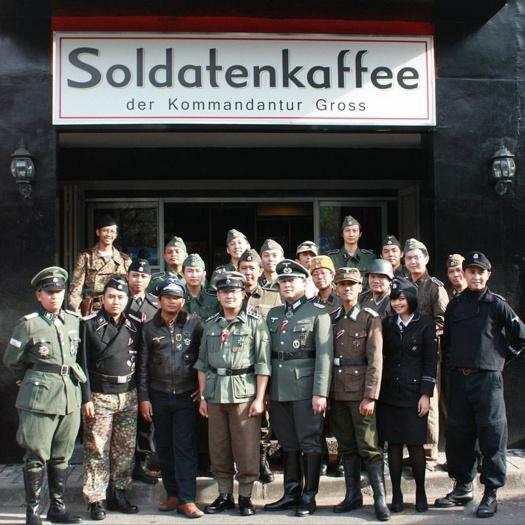 The "Soldatenkaffee" or Solider's Cafe is named after a famous Parisien watering-hole that was popular among German soldiers during the 2nd Word War. 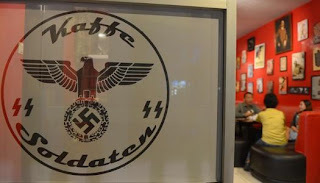 I'm sure the Fuehrer would approve of this incarnation as long as no "black" coffee is served of course!!! The owner, Henry Mulyana, has stated that he "...simply adores the soldiers paraphernalia". It makes you wonder what's on Mr Mulyana's menu, perhaps a"Luftwaffe Latte", maybe a "Mussolini Mocha" or how about an Americano "Auswitchz style". I can just picture his advertising slogan..."only the beans are roasted"!!!! Opppss was that last comment a little close to the knuckle? 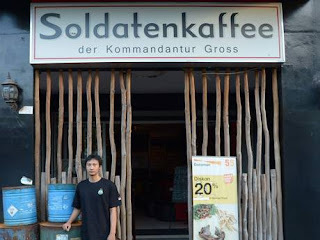 Although the cafe has been in operation for several years, it is only recently that it has been bought to the attention of the Western media. It has caused quite a furore with Germany making official protests to the Indonesian government and Jewish groups expressing their outrage. But they fail to realise that most Asians are ignorant of the events that occurred during the 2nd World War and even those who are aware, don't give a sh1t. 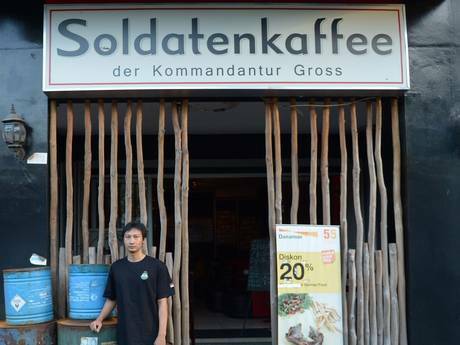 A patron of the cafe, Mr. Arya Setya is reported to have said 'We're living in Indonesia and Indonesians weren't tortured in the Holocaust, so we don't really care". Maybe I should move to Aceh and open a "tsunami-themed cafe" decorated with life-vests and rubble and dress the waiting staff as bloated, decomposing corpses because, to paraphrase Mr. Setya, I "don't really care" about the peasants in the sh1t-hole that is Indonesia.